SUBHEAD: New study of hot particles shows full radiation risks from Fukushima meltdowns are not recorded. 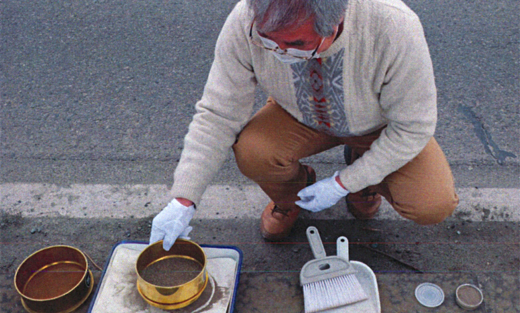 Image above: Scientist gathers particle sample along curb in Japan for radioactive analysis. Photo by Mikeo Kawasaki. From (http://audioslides.elsevier.com/viewersmall.aspx?doi=10.1016/j.scitotenv.2017.07.091&source=0). Today, the scientific journal Science of the Total Environment (STOTEN) published a peer-reviewed article entitled: Radioactively-hot particles detected in dusts and soils from Northern Japan by combination of gamma spectrometry, autoradiography, and SEM/EDS analysis and implications in radiation risk assessment. Co-authored by Dr. Marco Kaltofen, Worcester Polytechnic Institute (WPI), and Arnie Gundersen, Fairewinds Energy Education, the article details the analysis of radioactively hot particles collected in Japan following the Fukushima Dai-ichi meltdowns. Radioactive particles from Fukushima are tracked via dusts, soils, and sediments. Radioactive dust impacts are tracked in both Japan and the United States/Canada. Atypically-radioactive particles from reactor cores are identified in house dusts. Scanning electron microscopy with X-ray analysis is used for forensic examinations. Based on 415 samples of radioactive dust from Japan, the USA, and Canada, the study identified a statistically meaningful number of samples that were considerably more radioactive than current radiation models anticipated. If ingested, these more radioactive particles increase the risk of suffering a future health problem. The same level of risk exists in Japan. While most people have an average level of risk, a few people get an extra spark from a hot particle. According to Dr. Kaltofen, “The average radiation exposures we found in Japan matched-up nicely with other researchers. We weren’t trying to see just somebody’s theoretical average result. We looked at how people actually encounter radioactive dust in their real lives. Combining microanalytical methods with traditional health physics models,” he added, “we found that some people were breathing or ingesting enough radioactive dust to have a real increase in their risk of suffering a future health problem. Mr. Gundersen said, “which is a step-by-step factual account of the reactor meltdowns, was a best seller in Japan and enabled us to build amazing relations with people actually living in Japan, who are the source of the samples we analyzed. Fairewinds Energy Education founder Maggie Gundersen said, “We are very thankful to the scientists and citizen scientists in Japan, who sought our assistance in collecting and analyzing this data. We will continue to support ongoing scientific projects examining how people in Japan and throughout the world experience radioactive dust in their daily lives." The complete peer reviewed report and project audio description by Dr. Kaltofen are available here at the Science of the Total Environment website. Interactive data and the supporting materials are available here at the Fairewinds Energy Education website. Video above: Arne Gundersen about hot particles. Tokyo soil samples would be considered nuclear waste in the USA. From (https://vimeo.com/38995781). Well both Tepco and the Japanese government have been lying about the actual facts regarding the disaster since 2011. But really..... the con is much bigger: the truthful facts on radiation toxicity have been carefully obfuscated for ages by all nations profiteering from nuclear energy, medical radiation, and nuclear weaponry, such as the US, France, Russia, India, or Japan. The conventional medical-dental industries and the nuclear-military industries (=the radiation cartel) have been, for well over half a century, perpetually lying about, and minimizing, the true toxicity of ionizing radiation (e.g resorting to false sneaky comparisons between radiation exposure from sunlight or an airplane flight to a dental or medical x-ray or the exposure to nuclear fallout, etc. to deliberately deceive the unwitting public) to avoid culpability for the huge number of deaths and injuries that they're responsible for (discussed and well referenced in the book "The Mammogram Myth" by Rolf Hefti --- outline at http://www.supplements-and-health.com/mammograms.html ). You can recognize the global grip of this powerful big money cartel by the ominous absence in the reporting of the allied corporate mass media (the mainstream fake news media) about the ongoing severe disaster at Fukushima, or by any of the solid proofs about the frauds this criminal evil cartel is involved in. You can find out more about that from Dr. Chris Busby, Dr. Helen Caldicott and others who are not tied to the corrupt radiation cartel.